An overlooked entry this week, a group who were one of the very best at what they did but who have never been fully recognised as such. Edition #16 – Rise and Shine: The Wake. The Wake have often been placed among the second-tier Factory Records outfits, considered to be a band that did well but never really got out of the shadows of labelmates. 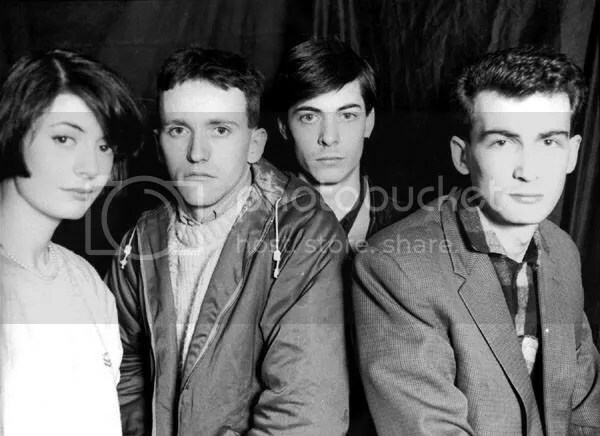 With the perspective that passed time allows, though, it’s clear to see that they were more than just the Scottish New Order, having left behind over a decade’s worth of gems that are still waiting to be discovered. Formed in Glasgow in 1981 by Caesar (Gerard McInulty) – at the time just recently departed from the early incarnation of Altered Images – and rhythm section Steve Allen and Joe Donnelly, the group’s first order of business was releasing a single on their own, a move which paid off perfectly. The single, “On Our Honeymoon” b/w “Give up,” came out in 1982 and caught the attention of Factory Records figure Rob Gretton. His interest soon led to the band’s signing to Factory and the release of their debut album that same year. Bobby Gillespie and Carolyn Allen were added to the lineup on bass and keyboard (respectively) just before the debut, Harmony, was recorded, and upon the record’s release, the group entered their prime period. They would have been untouchable, perhaps, but their problem was that they had New Order out in front of them. Despite the differences in sound between them the two groups were similar enough that they could be held together, and although New Order had been around only a year or so longer, by the time the two groups toured together in 1983 they were much better established and more popular, resulting in The Wake being viewed as something of a runner-up act. Poised to be another Factory success, The Wake released a series of singles through 83-84 and then their second LP, Here Comes Everybody, in 1985. These records showcased the band further perfecting their style, and it’s impressive, really, how many brilliant tunes this group had. Many of the songs they put down between 1982 and 1987 would be beloved classics today if they’d had the proper attention paid to them at the time. From the eerie first album, through the warmer mid-eighties stuff, to their last release for Factory – the Something No One Else Could Bring EP in 1987 – The Wake turned out exceptionally melodic tunes that stand the test of time. After this period, though, it still wasn’t happening for them and the band left Factory dissatisfied, complaining of improper promotion and handling. They resurfaced not long after, though, with a single, followed by two albums in the early nineties, all released on the UK indie-pop label Sarah Records, and what’s interesting about this period of the band is how well they transitioned between the older style and the emerging nineties style of jangly indie pop, providing a great example of the often-unexplored bridging between the eighties and nineties. The partnership with Sarah Records lasted until 1995, when both the label and The Wake folded. In the years since, Caesar and Carolyn have been part of The Occasional Keepers, who have released two albums (in 2005 and 2008), and have also performed as The Wake off and on. For the available Wake discography, one needn’t look further than the LTM re-issues, it’s all there. The Factory-era and Sarah-era albums have been put out again with accompanying singles included, and so has a live DVD recorded at the Hacienda club in 1983-4, all of which is worth checking out for anyone interested in ’80s UK indie pop and one of the best groups thereof.